End of the month = time for a Daring Bakers post! Patri of the blog, Asi Son Los Cosas, was our September 2012 Daring Bakers’ hostess and she decided to tempt us with one of her family’s favorite recipes for Empanadas! We were given two dough recipes to choose from and encouraged to fill our Empanadas as creatively as we wished! 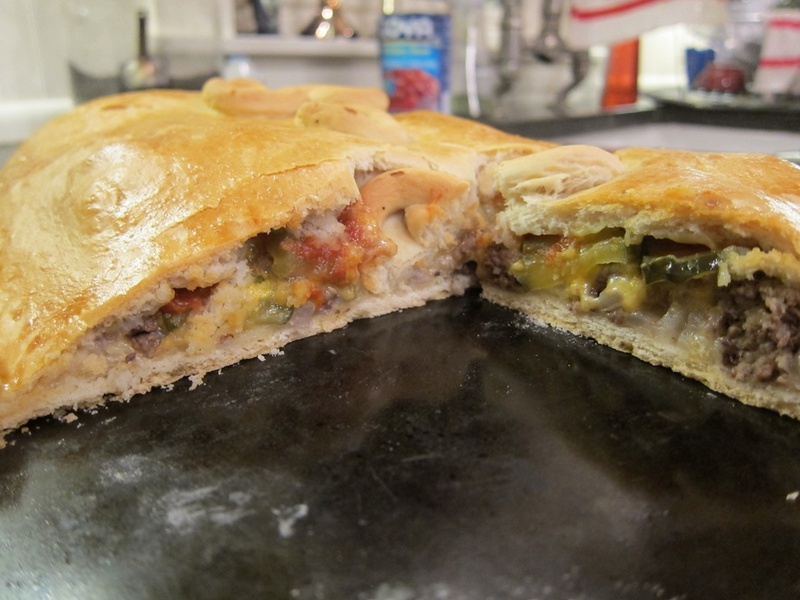 I’d been in the mood for cheeseburger pizza for a while, and adapted to the challenge. In a large bowl, stir together the flour, yeast, olive oil, salt, and garlic powder. 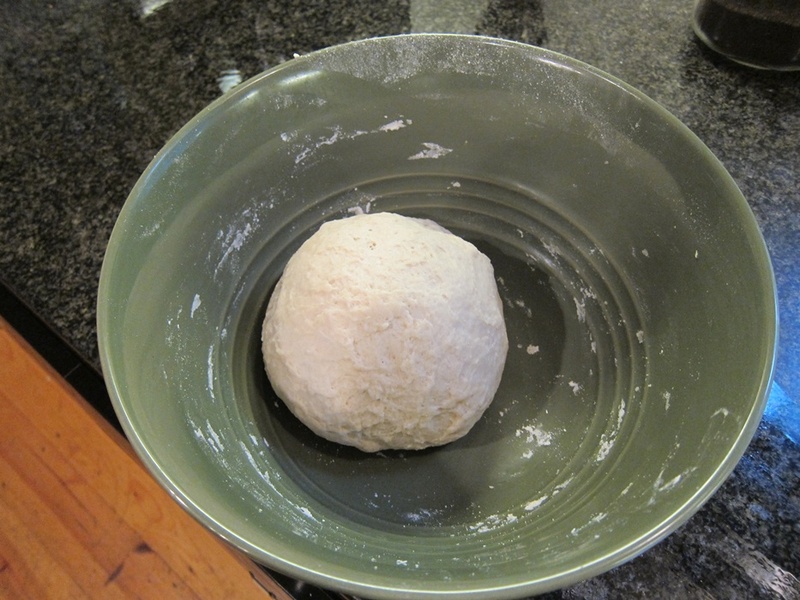 Knead until smooth, then shape into a ball and put in a lightly greased bowl. Cover, and let rise somewhere warm for 45 minutes. 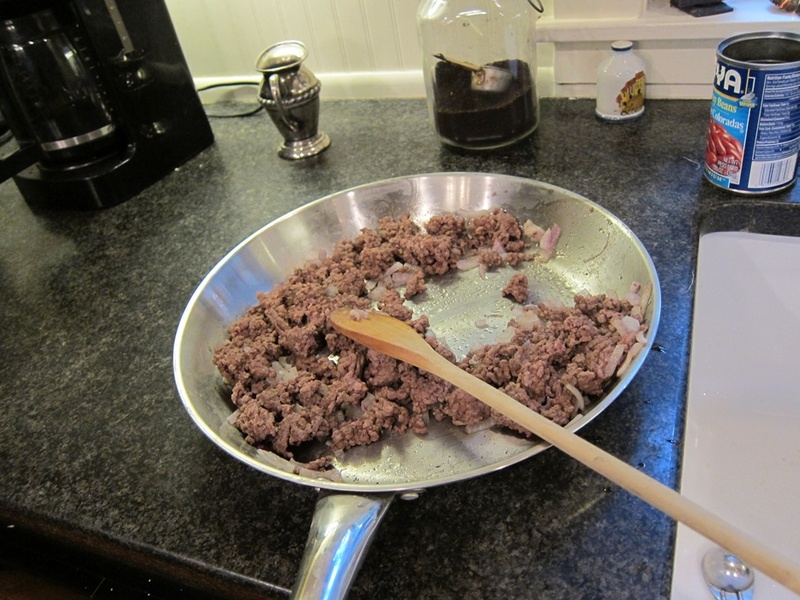 While you wait, cook the beef and onion in a pan over medium heat until the beef is browned. Drain excess grease. When the dough has risen, divide it in half. Roll one half out to about 1/8″. If you roll it out on a piece of parchment paper, it’s a bit annoying while you’re rolling, but then much easier to transfer the flat dough to a baking sheet. Spread the beef/onion mixture over the dough, leaving an inch of dough free on all sides. Cover the beef with the cheese, followed by pickles and ketchup to taste. I was low on ketchup, or there would be more. I love ketchup. Roll out the second piece of dough, and place over the top of the first piece. 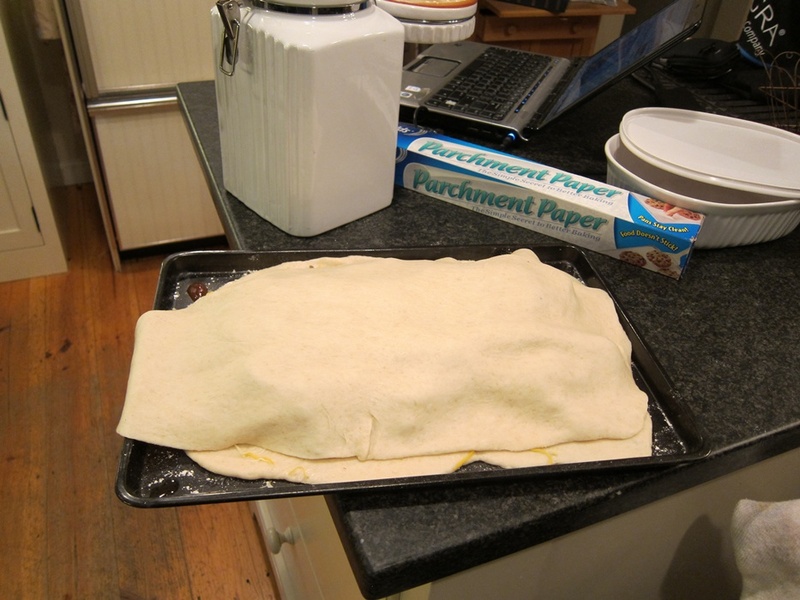 Cut off any extra flaps of dough, then press the two layers together, all the way around, to seal. Go back around, this time twisting the two layers of dough together to make a border. Cut a hole out of the center of the top piece of dough, and prick all over with a fork (I forgot that part!). If you have any extra dough, you can use it to decorate. Brush the top with the egg wash.
Bake for 45 minutes, let sit for 5, and enjoy. This actually keeps pretty well out of the fridge (ie I didn’t get food poisoning eating this 3 unrefrigerated days later, and the texture of the crust was better unrefrigerated). 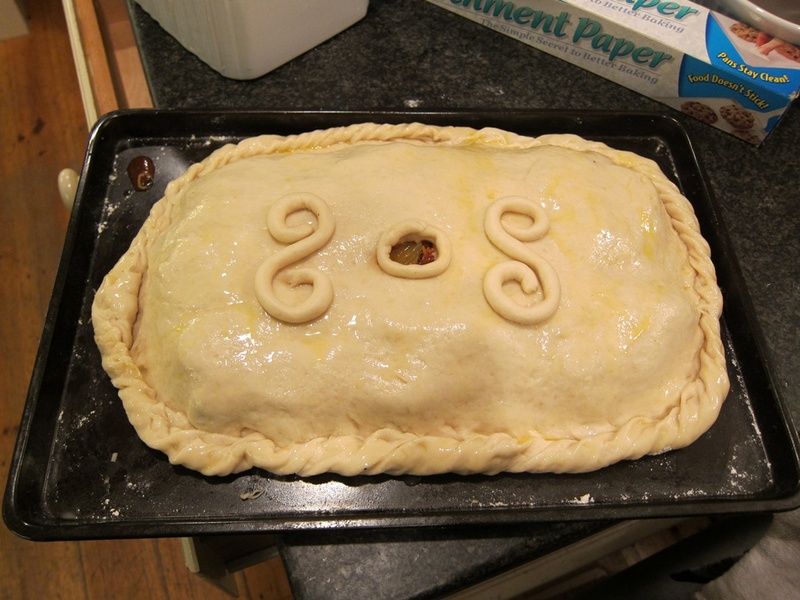 I really like the crust, and…y’know. Cheeseburgers. I like them too. Good combo. 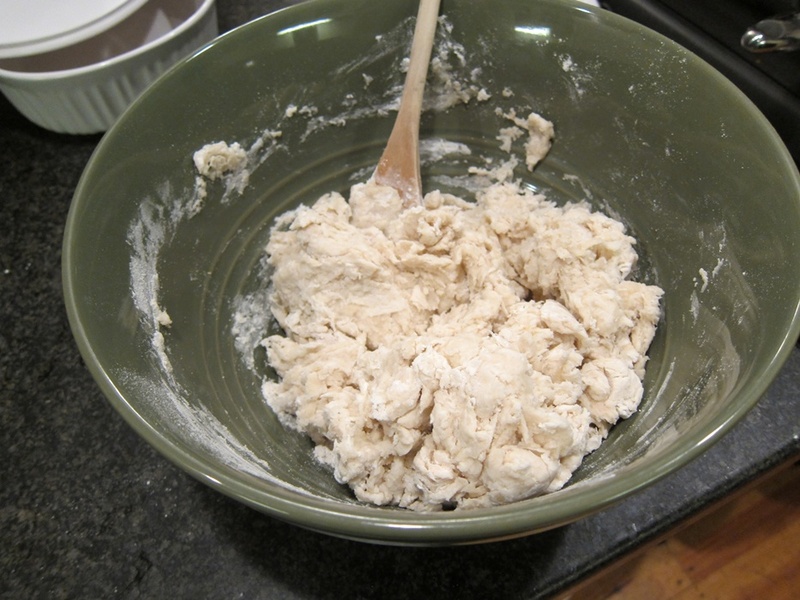 In a large bowl, stir together the flour, yeast, olive oil, salt, and garlic powder. 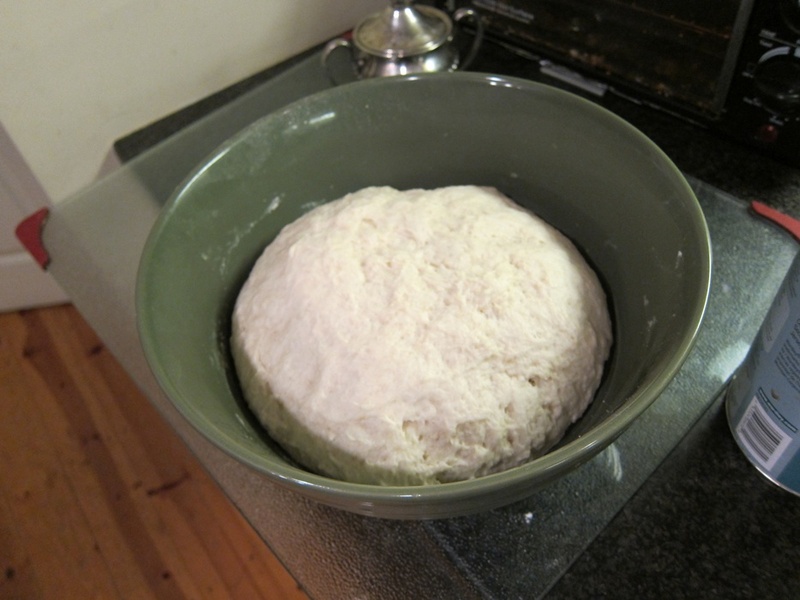 Knead until smooth, then shape into a ball and put in a lightly greased bowl. Cover, and let rise somewhere warm for 45 minutes. When the dough has risen, divide it in half. 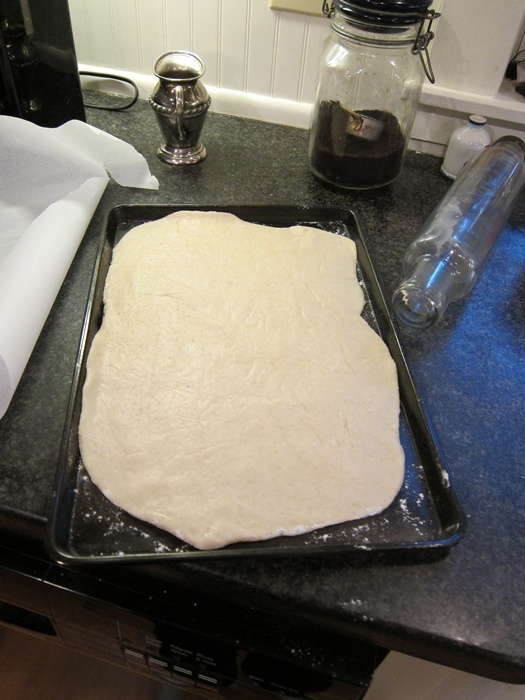 Roll one half out to about 1/8″ thick and transfer to a baking sheet. 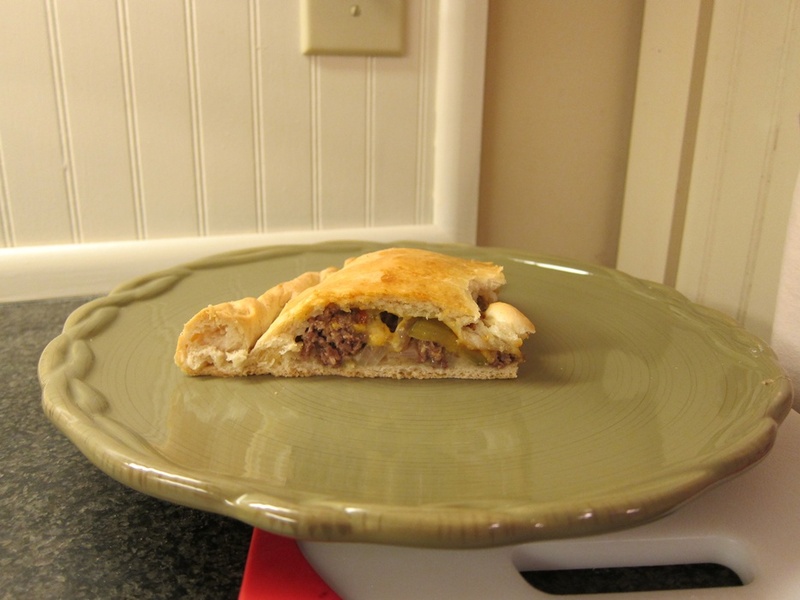 Spread the beef/onion mixture over the dough, leaving an inch of dough free on all sides. 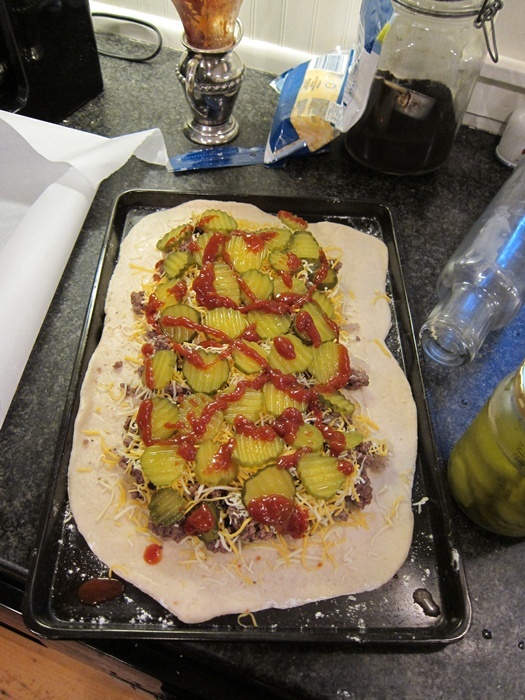 Cover the beef with the cheese, followed by pickles and ketchup to taste.Roll out the second piece of dough, and place over the top of the first piece. Cut off any extra flaps of dough, then press the two layers together, all the way around, to seal. Go back around, this time twisting the two layers of dough together to make a border. Cut a hole out of the center of the top piece of dough, and prick all over with a fork. Decorate with extra dough if desired. Brush the top with the egg wash.
Bake for 45 minutes, then let rest 5 minutes before serving. 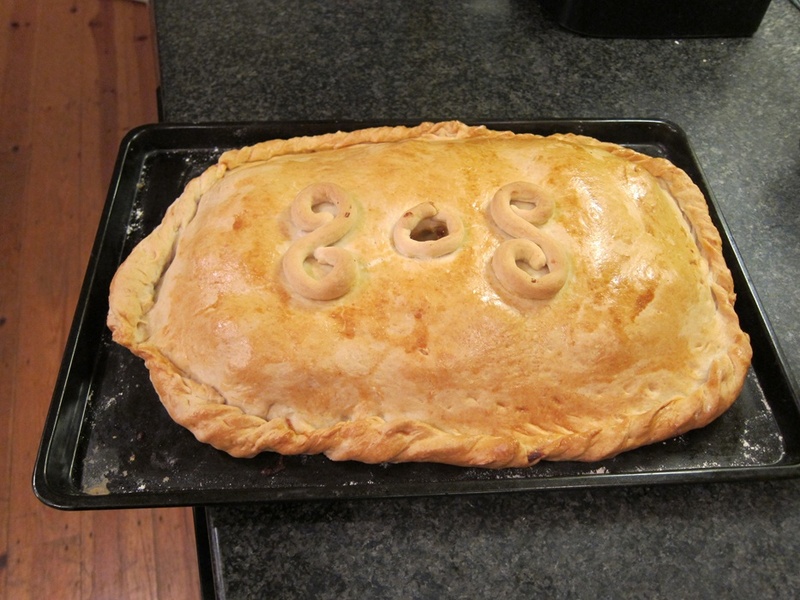 This entry was posted in Dinner and tagged Cheeseburger, Daring Bakers, empanada. Bookmark the permalink.